Can the iPhone 8 compete with the Galaxy Note 8? Samsung is working hard to ensure that its upcoming new Galaxy Note 8 is the hottest new smartphone of 2017, but only figuratively this time. The Galaxy Note 7 was nothing short of a total disaster, which is obviously a shame since reviewers and consumers alike absolutely loved the phone until it started exploding in people’s hands. In 2017, Samsung moved toward a fresh and exciting new design with the Galaxy S8 and Galaxy S8+. The phones’ new Infinity Displays occupy an impressive 83% of their front sides, creating a more immersive experience than we’ve ever seen before on a widely available flagship smartphone. According to recent reports, the Galaxy Note 8 will be similar to the Galaxy S8 series in terms of internal hardware, as the phone is expected to be powered by Qualcomm’s Snapdragon 835 and Samsung’s Exynos 8895 chip, depending on the region, in addition to featuring 4GB or 6GB of RAM and 64GB of internal flash memory that will likely be expandable. The device will ship with some version of Android Nougat enhanced with Samsung’s proprietary mobile software suite and is expected to be offered in dual-SIM variants in certain markets. 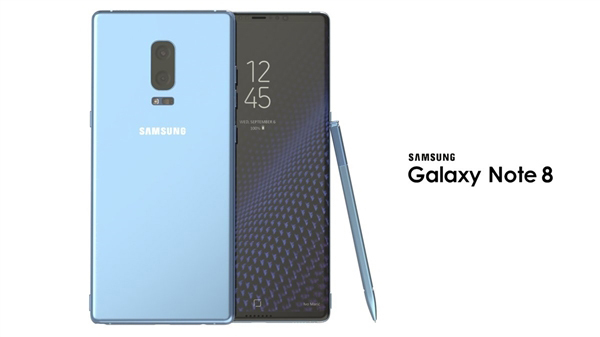 Previous sketchy reports regarding the Galaxy Note8 told us it would sport a dual rear camera arrangement, a 6.3″ or 6.4″ AMOLED screen (with the same 18.5:9 aspect ratio employed by the S8 and S8+, we assume), the same chipset choices as the Galaxy S8 duo, and perhaps even the same rear-mounted fingerprint sensor. On the other hand, the scanner was also rumored to be placed under the display, so nothing’s certain at the moment.